Reliably covers and protects your payload. Fingertip electric controls for ease of operation. Sturdy weather and corrosion-resistant aluminum components for reliable performance, time after time. Choose from high speed, high torque or regular gear motors with 1 or 3 year warranties. Fits dump bodies from 8 ft to 23 ft long. From gravel to asphalt, keep your payload in the truck and out of the weather. With strong, reliable technology and fingertip controls, the Side Mount Tarp System from Buyers Products has got you covered. 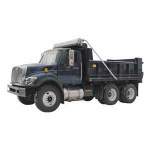 Choose from a wide selection to fit dump bodies from 8 ft to 23 ft.